The Lava the Original 14.5-Inch Silver Base Lamp with Orange Wax in Blue Liquid brings the drama of motion and the beauty of soft colored light into your very own space. 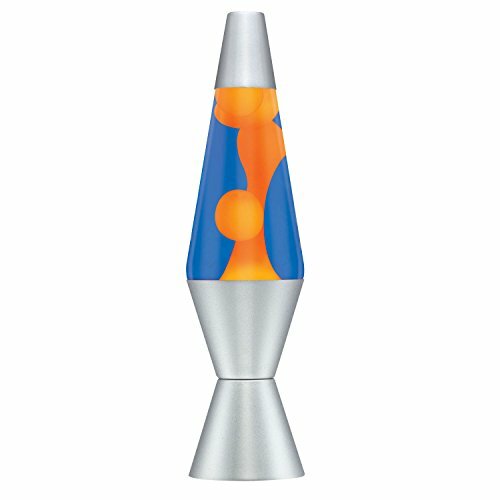 Watch the orange blobs suspended in blue liquid collide, flow, and split apart as they ooze their way up, down, and around the glass globe of this classic Lava the Original lamp. A hand-spun silver aluminum base and cap make this lamp truly unique. Enjoy the colorful motion of this classic version of the timeless Lava the Original lamp. For over fifty years, the iconic Lava the Original brand has been the pioneer in novelty and conventional lighting products, and today it stands as one of the most recognized, trusted, and beloved brands of all time. At Lava the Original, our commitments to pursuing the latest fashion trends, cutting-edge technology, and unsurpassed quality ensure that we continue to intrigue our older fans while enticing the younger generation with our exciting new product lines. So whether you are six or sixty, we have a Lava the Original lamp product just right for setting the mood of your life. If you have any questions about this product by Schylling, contact us by completing and submitting the form below. If you are looking for a specif part number, please include it with your message.